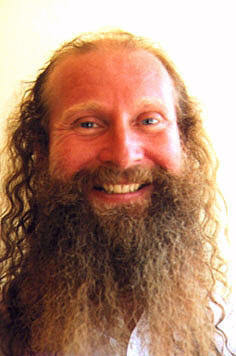 ARTICLE ON ENERGY ENHANCEMENT FROM THE YOGA MAGAZINE OF GREAT BRITAIN - FIND OUT WHAT THEY SAY!! Energy Enhancement does exactly what it says on the Tin! 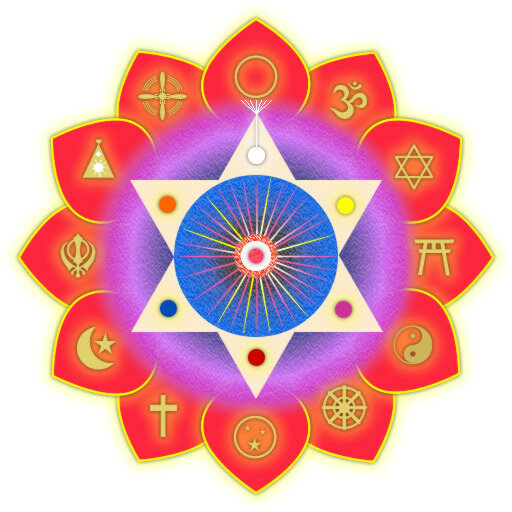 Kundalini Alignment with Energy Enhancement The awakening of the Kundalini Energy starts from the base chakra and as it rises it continues to pierce into all the seven chakras as I was told by Honey Kalaria. 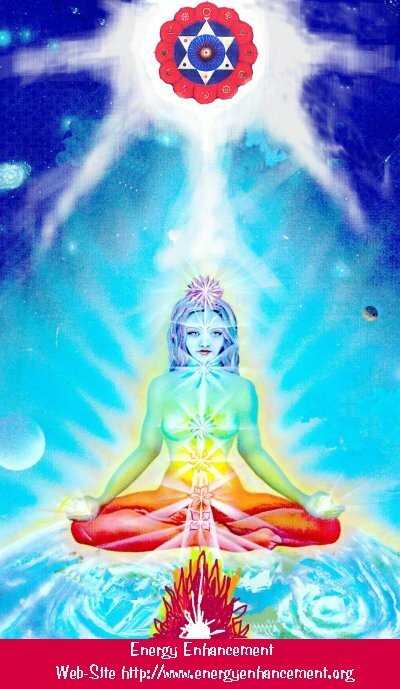 And when I performed this exercise, one of the first of the Energy Enhancement Initiations, what I experienced was a powerful energy shooting into my base chakra and rising through my body, feeling like a large column of white light, piercing through each chakra at a rapid speed and shooting out of my crown chakra. The feeling was so strange. I was hot but felt cold at the same time. My hands, arms and legs were shaking and shivering and yet I was not cold………what a strange feeling and I felt connected. Dhiren Raichura. London, UK, Music Producer, Composer, Singer, Songwriter and a musician. CLICK HERE FOR THE ENERGY ENHANCEMENT TESTIMONIALS - WHAT THE STUDENTS OF ENERGY ENHANCEMENT SAY!! get in touch directly. I also have some great shots to accompanying. I'll scan them in and get to you asap. I have placed some of the many pictures I took within the article. All of the people seen below, our old students, Paul, Danisa, L.B., and Lisabeta, have made testimonials for ENERGY ENHANCEMENT so see them here.. CLICK HERE FOR TESTIMONIALS PAGE. Since meeting us Danisa De Paul and L.B. have become Yoga Teachers, Dance Teachers, Dance Performers, Meditation teachers, Lisabeta is still glowing, and Paul and Joseph, we will hear more about them next year I am sure, are still progressing fast on their path to enlightement. Last summer, after three years of on-and-off asana practicing, I thought it was about time I did a few mental exercises too. 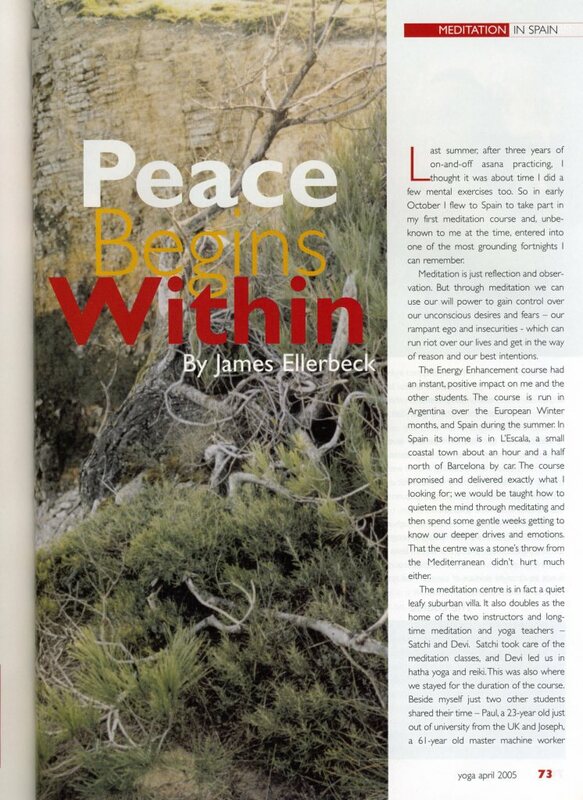 So in early October I flew to Spain to take part in my first meditation course and, unbeknown to me at the time, entered into one of the most grounding fortnights I can remember. Meditation is just reflection and observation. But through meditation we can use our will power to gain control over our unconscious desires and fears – our rampant ego and insecurities - which can run riot over our lives and get in the way of reason and our best intentions. 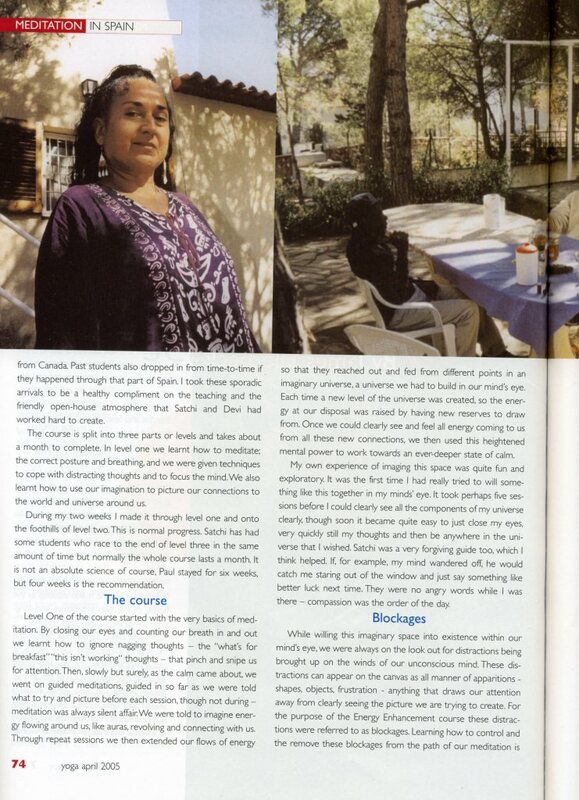 The Energy Enhancement course is a beautiful course that had an instant, positive impact on me and the other students. The course is run in Argentina over the European Winter months, and Spain during the summer. In Spain its home is in L’Escala, a small coastal town about an hour and a half north of Barcelona by car. The course promised and delivered exactly what I looking for; we would be taught how to quieten the mind through meditating and then spend some gentle weeks getting to know our deeper drives and emotions. That the centre was a stones’ throw from the Mediterranean didn’t hurt much either. The meditation centre is in fact a quiet leafy suburban villa. It also doubles as the home of the two instructors and long-time meditation and yoga teachers – Satchi and Devi. Satchi took care of the meditation classes, and Devi led us in hatha yoga and reiki. This was also where we stayed for the duration of the course. Beside myself just two other students shared their time – Paul, a 23-yr old just out of university from the UK and Joseph, a 61-year old master machine worker from Canada. Past students also dropped in from time-to-time if they happened through that part of Spain. I took these sporadic arrivals to be a healthy compliment on the teaching and the friendly open-house atmosphere that Satchi and Devi had worked hard to create. The course is split into three parts or levels and takes about a month to complete. In level one we learnt how to meditate; the correct posture and breathing, and we were given techniques to cope with distracting thoughts and to focus the mind. We also learnt how to use our imagination to picture our connections to the world and universe around us. During my two weeks I made it through level one and onto the foothills of level two. This is normal progress. Satchi has had some students who race to the end of level three in the same amount of time but normally the whole course lasts a month. It is not an absolute science of course, Paul stayed for six weeks, but four weeks is the recommendation. Level One of the course started with the very basics of meditation. By closing our eyes and counting our breath in and out we learnt how to ignore nagging thoughts – the “what’s for breakfast” “this isn’t working“ thoughts – that pinch and snipe us for attention. Then, slowly but surely, as the calm came about, we went on guided meditations, guided in so far as we were told what to try and picture before each session, though not during – meditation was always silent affair. We were told to imagine energy flowing around us, like auras, revolving and connecting with us. Through repeat sessions we then extended our flows of energy so that they reached out and fed from different points in an imaginary universe, a universe we had to build in our mind’s eye. Each time a new level of the universe was created, so the energy at our disposal was raised by having new reserves to draw from. Once we could clearly see and feel all energy coming to us from all these new connections, we then used this heightened mental power to work towards an ever-deeper state of calm. My own experience of imaging this space was quite fun and exploratory. It was the first time I had really tried to will something like this together in my minds’ eye. It took perhaps five sessions before I could clearly see all the components of my universe clearly, though soon it became quite easy to just close my eyes, very quickly still my thoughts and then be anywhere in the universe that I wished. Satchi was a very forgiving guide too, which I think helped. If, for example, my mind wandered off, he would catch me staring out of the window and just say something like better luck next time. They were no angry words while I was there – compassion was the order of the day. While willing this imaginary space into existence within our mind’s eye, we were always on the look out for distractions being brought up on the winds of our unconscious mind. These distractions can appear on the canvas as all manner of apparitions - shapes, objects, frustration - anything that draws our attention away from clearly seeing the picture we are trying to create. For the purpose of the Energy Enhancement course these distractions were referred to as blockages. Learning how to control and the remove these blockages from the path of our meditation is a central aim of the course. We grounded them by circling them in light and sucking them into the nearest burning centre in the universe, the sun or the centre of the earth perhaps. Some were stubborn, and some easy to remove. As the course progresses, so the low hanging fruit get picked and we move on to deeper blockages. Once our grounding skills were tried and tested many times over, we used them to meditate on our lives, our relationships, our characters, and our work – every facet of ourselves organised and charted systematically. We took notes after each session and large parts of our free time were spent talking about our progress and what kind of thoughts and emotions were being unearthed during own meditations. A blockage, you see, is a symptom of a deeper malady. With fervour we drew up hit lists of trouble spots in our lives became the next list of thing to meditate on – so in anyone session different people would be meditating on different things – one person perhaps on a relationship, another person might be looking on a part of their character and so on. I found this to an exceptionally cathartic experience, a real tonic, and it was quite common for different parts of the house to be full of laughter at any given time of the day. It was a joyous two weeks. L.B., AFTER HER ENERGY ENHANCEMENT COURSE LAST YEAR, AFTER NO PREVIOUS DANCE, YOGA OR MEDITATIONAL EXPERIENCE, BECAME A YOGA, DANCE AND MEDITATION TEACHER AND A DANCE PERFORMER. Level three is about mastering relationships, which uses the lessons of levels one and two and brings them to bear on problems in our social connections in the world and our “strategies”. These strategies I didn’t really meditate on during the course as I was only there for half of it, but we did talk about this level frequently. Strategies are the acts we put on to get ourselves through life. Acting tough, craving sympathy, constantly trying to please – a whole host of strategies employed by the ego, some of which are so deeply ingrained with our character that they have become part of us. Level three teaches nonattachment to these strategies, students learn how to ground them to rid themselves of the fears and insecurities that prop the strategies up. This aspect of the course I was truly fascinated by and I will try and make an effort in 2005 to visit the guys again to explore this level in more depth. All in all there is far more to the course than I can go into here. Aside from the teaching, I could talk about the food for days, well-combined vegetarian feasts by the way, or Devi’s infectious laugh and sense of humour. I also fondly remember my long talks with Satchi about engaging with the world and generally look back on the whole experience as a real turning point for me. A time to stop and take a look at how far we have come. Arriving back in England I danced the whole night away, something I hadn’t done in a while. Energy Enhancement does exact what it says on the tin. 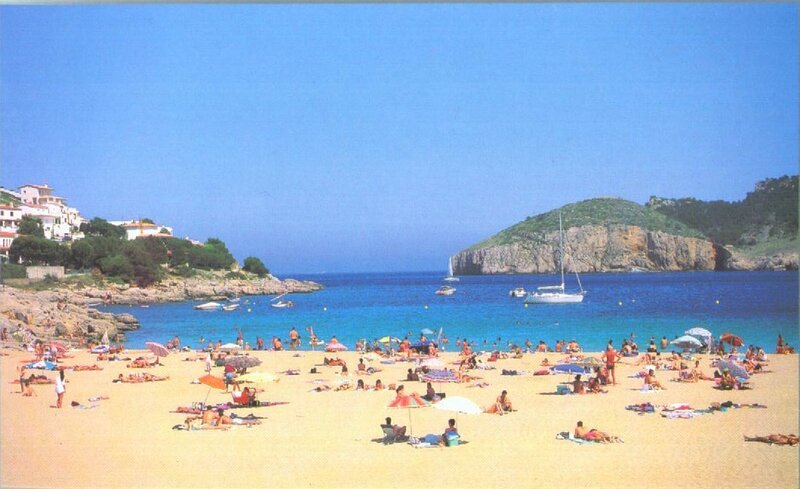 The nearest airport to L’Escala is Girona, where pick-up can be arranged. Ryan Air flies direct to Girona from London (see Ryanair.com). L’Escala is also connected to France and the rest of Spain by train. For a wealth of information about the Energy Enhancement visit the Energy Enhancement website at www.energyenhancement.org or contact Satchi directly at sol@energyenhancement.org. SIGN ONTO THE MAILING LIST FOR PRICES. FREE PICKUP AND RETURN FROM BUENOS AIRES AIRPORT. THIS SPECIAL OFFER IS ONLY POSSIBLE BECAUSE OF US BEING IN ROSARIO AT THIS TIME. THE HOTEL IS WONDERFUL, WE HAVE STAYED THERE MANY TIMES. YOU WILL ENJOY ROSARIO AND ITS ENVIRONS, AND OF COURSE, THE ENERGY ENHANCEMENT COURSE! Bring comfortable loose clothes for yoga and sitting. If you are Zen then bring your Zafu. Normally JANUARY is very hot, but this luxurious hotel with its own private swimming pool and sauna, jacuzzis in every room, is centrally air conditioned and you will be extremely comfortable. FLIGHTS ARE POSSIBLE FROM EUROPE AT 400 TO 500 UK POUNDS, YOU WILL NEED TO LOOK AROUND. Location: Located in the heart of Rosario, near San Martin pedestrian street, the banking and commercial area, with important malls and in front of the cultural center Bernardino Rivadavia. Amenities Hotel: Laundry, Bar, Meeting Rooms, 24 hour room Service, Swimming-pool, Sauna, Solarium, Gymnasium. Amenities Rooms : Private Bath with Jacuzzi, Modem Connection, Phone, Cable TV, Minifridge bar, Electronic locks, Air conditioning, Safety boxes, Hair dryer. Number of Rooms : 55 Singles, Doubles and Triples rooms and 5 Suites. Rates: All rates are in US dollars, including taxes and service surcharge, rates are per night, per room. Rates Include : Buffet Breakfast. EUROPEAN WINTER IS ARGENTINE SUMMER, BECAUSE IT IS SOUTH OF THE EQUATOR. 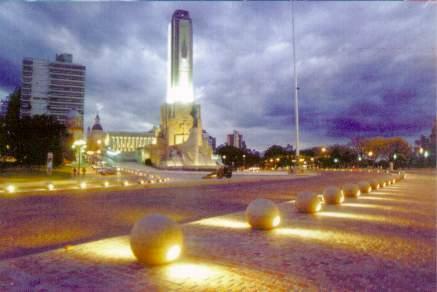 This is the Monument of Rosario. 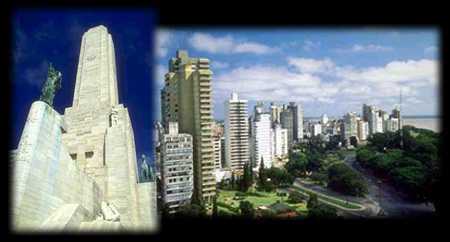 Designed by a Mason, surrounded by the four elements it is said by Spiritual Masters to be a focus for the Spiritual Energies which are now energising Rosario. There are many clubs in Rosario where people go to dance the Tango and where Tango Masters give expositions. The Monument and flowering Jacaranda Trees down near the river, Rosario. On the other side of the river you see the sand banks where people take the sun and bathe in the river. 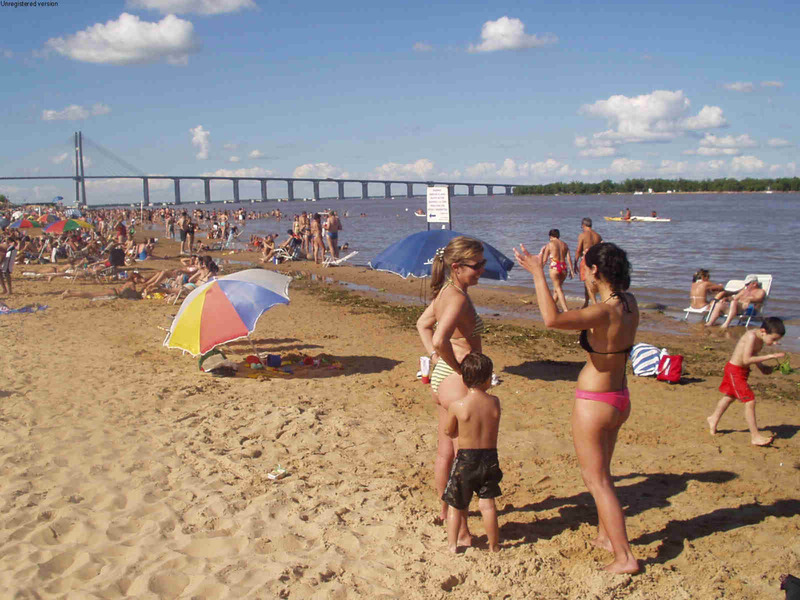 Beneath is La Florida beach in Rosario and the new bridge on the side of the River Parana, which is 50 kilometers wide at this point. We also take trips to the sandbanks sunbathing on the other side and over to Victoria and the Benedictine Monastery on the other side. Below, This picture is from a satelite on high. The left pink is Rosario and the Right pink Victoria, the little town on the other side of the river. This picture is from a satelite on high. The blue is the Parana River - Rosa Rio - the Pink River, the second largest river in the world. It is 50 KM wide at Rosario. Take a trip over to Victoria by boat and in 10 minutes you are in the depths of nature, of something like you would imagine the Amazon to be. This testimonial has been provided by Pierre Morency after his Executive Retreat to the Taj Mahal with us. Pierre is a previous member of International Consultants, McKinsey and Company. Management Consultants who recruit mainly Rhodes Scholars, universally used by all major International Companies for consultation and as a selection ground for future Chief Executive Officers, CEO's. Energy Enhancement proves its use for all levels of business and professionals - in fact for anyone who wants to access their inherent energies. Energy Enhancement speeds up the process of gaining more Energy! Pierre came on one of our Energy Enhancement Training Adventures in India, visiting the Taj Mahal and the Foothills of the Himalayas and travelling from his home in Canada. Usually we go for one week for one Level of Energy Enhancement, learning the Techniques in 5Star Hotels. Pierre learnt Two Levels of Energy Enhancement. The process he describes in his case was very quick as is his nature. Pierre himself is a marketing consultant to many International Companies and CEO's. "Last June, I had the privilege to get my first taste of India, an Executive Retreat in the Company of two wonderful, knowledgeable and fun people, Satchi and Devi. From day one, they were able to stabilize me in this strange and mysterious country. Thank you for the Executive Retreat, Satchi and Devi.